A designer who is set to transform a Cornish library as part of a national project has paid his first visit to the site. 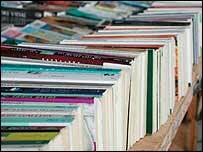 Newquay Library is one of three in the country to be chosen to be revamped as part of the Love Libraries initiative. Tony Coffield from Curious Architecture has spent two days in Newquay this week discussing ideas with staff. The makeover of the building in Newquay and the two other libraries in Richmond and Gravesend will be unveiled in July. The 1960s building in Newquay will be remodelled and there will be a new range of activities and also substantial improvements to the stock of the library. Library Service staff have spent the past two weeks consulting people in Newquay about what they would like to see in the redeveloped building. And library manager Gill Provis said staff have lots of ideas. "Over the past two days we have discussed our wish list with Tony, and have asked him to incorporate ideas for a new children's area, a Cornish section, a Quick Pick area, a new counter, a new youth area and an audio visual section," she said. "We are also keen to have a new books area which will only display books published in the last three months." The Love Libraries project has been created by The Future Libraries Partnership, an alliance of public and private bodies.